This is an Excellent opportunity to purchase 36,000 sq. 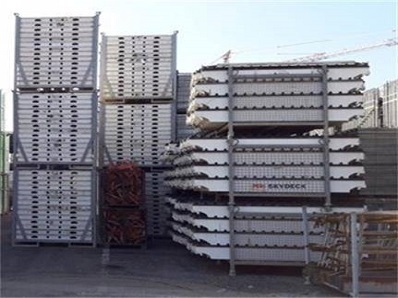 ft. of used PERI "Skydeck" panels, including Drop Heads and Main Beams located in the U.S.A. Very difficult to find in the used marketplace and available at HUGE SAVINGS. Can buy all or part. Please reach our sales department to discuss further 888-367-7553. The proven, fast slab formwork made of high-strength aluminum product range 8.10 SKYDECK Important notes: Our products are to be used in accordance with the relevant national and European safety regulations. The illustrations in this brochure are photographs of real site situations. Safety or formwork anchor details are therefore not to be taken as a definitive guide to the way the equipment is to be used. Safety precautions and allowable loads are to be Strictly observed. Separate structural calculations are required for any deviations from the standard design data. The information contained herein is subject to technical change in the interests of progress. The proven aluminum slab formwork system 2 – 3 The cost-effective slab formwork with many advantages for the user 4 – 5 Forming with drop head 6 – 7 SKYDECK infills 8 – 9 Detailed solutions with system components 10 Even the logistics have been rationalized 11 Design tables 12-19 Range 20-33 PERI International 36-37 2 60 mm PERI SKYDECK The proven aluminum slab formwork system for sensationally fast formwork erection SKYDECK’s main beam reduces the number of props You only need 0.29 props per square meter of slab. This corresponds to a grid rectangle of 2.30 x 1.50 m (3.45 m2) supported by just one Prop. Fewer props save time and leave more space. Formwork materials can be transported Across the site, or building materials such as bricks easily stored between these widely spaced props ready for subsequent use. SKYDECK has a drophead that allows you to strike after only 1 day (depending on the depth of the slab and concrete strength). This allows you to reduce formwork stock levels on site, since the beams and panels are than available for the next concreting cycle. Striking after a short time means striking and cleaning is also much Easier, since the panels separate from the concrete effortlessly. The drophead principle enables you to work more flexibly, for instance by striking early during poor weather, or when you have labor free. The large prop spacing of 1.50 x 2.30 m means time saving and more space for Moving materials. The panels and cover strips form the soffit of the concrete. The cover strips and drophead remain while the panels and beams are struck.